(Minghui.org) Over 1,000 Falun Gong practitioners participated in a candlelight vigil at Taipei City Hall Square on the evening of July 17, 2016. The event was one of a series of activities held in many nations calling for an end to the violent suppression of Falun Gong in China since July 1999. Candlelight vigil by Falun Gong practitioners at Taipei City Hall Square on the evening of July 17. Chang pointed out not only the scale but also the severity of the persecution, such as the killing of practitioners for their organs. With persistent efforts from practitioners, the atrocity has attracted attention in many countries. The United State House of Representatives passed H.Res.343 last month to condemn the harvesting of organs from living Falun Gong practitioners and other prisoners of conscience in China. In China, more than 200,000 criminal complaints have been filed against Jiang Zemin since last May. Over one million signatures have been collected in support of prosecuting Jiang, among which more than 660,000 come from Taiwan. Taipei City Councilor Chang Mao-nan admires practitioners’ courage. Several city councilors spoke at the event. Chang Mao-nan from Taipei referred to forced organ harvesting as a “crime against humanity.” He thanked practitioners for their hard work, and encouraged more people to join the event and sign petitions to support the effort to prosecute Jiang. Hsinchu City Councilor Zeng Zicheng said that freedom and human rights are universal values, adding, “Any government against them will be wiped out in history.” He hopes that the day will come soon when the suppression will stop, while the principles of Truthfulness-Compassion-Tolerance are widely celebrated in the world. 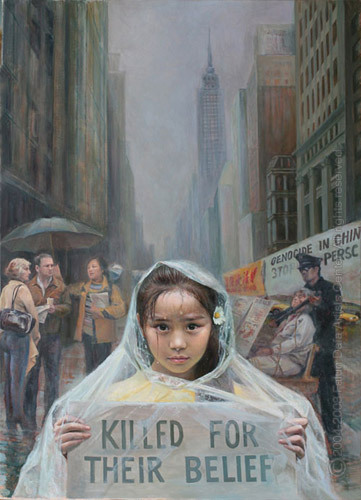 Hsu Chun-hsin, a law professor at National Cheng Kung University and former Legislative Member, called the persecution of Falun Gong a genocide. “Because it is a violation of international laws, it relates to all of us,” he asserted. Teng Biao, a renowned human rights lawyer, said it is difficult for outsiders to understand the severity of the suppression, noting that Western society has not paid much enough attention to this issue because these countries do not want to confront the Chinese communist regime for economic reasons. Ms. Luo, 65, started to practice Falun Gong in 2000. “Because of problems with my feet, I couldn’t walk at the time. Five days after I began doing the exercises, I could walk around slowly. Two days later, I saw a strong light from head to toe as I was doing the meditation. I no longer needed surgery for my foot, and I was fully recovered,” she recalled. In addition, she became more open-minded and now holds a positive attitude toward life. “Thinking about the the practitioners in mainland China, I want to cry, because they have suffered so much for their belief. I hope more people in this world will learn how good Falun Gong is,” she said. Seth Hirsch, 23, has practiced Falun Gong for four years. Seth Hirsch from Ohio in the U.S. came to know Falun Gong four years ago when he was 19. “Someone gave me a bookmark that had the website with Falun Gong teachings. That was a turning point of my life,” he explained. A boy holds a candle in memory of Falun Gong practitioners tortured to death for refusing to renounce their faith in mainland China. (Minghui.org) The 31st Asia-Pacific Academy of Ophthalmology Congress (APAO 2016) was held from March 24 to 27 in Taipei, Taiwan. Many eye doctors and medical professionals learned from this event about the organ harvesting from living Falun Gong practitioners in China. More than 4,000 ophthalmologists and healthcare professionals from Asia and other continents participated in the congress. Several Falun Gong practitioners working as volunteers at the event informed the attendees of the atrocity in China. One physician from Europe said he had heard about organ harvesting in China but did not know the details. After watching a documentary video on the subject, he was shocked and asked for a copy of State Organs: Transplant Abuse in China, a book about the involvement of Chinese state institutions in this severe human rights abuse. The physician came to the booth again the following day with more ophthalmologists. They discussed this further and a few physicians left their business cards for updates so that they could follow up on this issue. Ophthalmologists learn about live organ harvesting in China. The United States House Foreign Affairs Committee (HFAC) marked up H.Res. 343 on March 16. The resolution calls on the Chinese government to cease the practice of state-sanctioned organ harvesting from Falun Gong practitioners and to cooperate with investigations into these crimes. Many physicians shared what they had heard about organ trade in China. One ophthalmologist in Taiwan said that, if his patient made a donation to a certain foundation in China, he could be assured that an organ would be available in a short time. One eye transplant physician in southern China said organ transplants were widespread in China a few years ago. “Even a township hospital could perform hundreds of transplants each year,” he added. Another eye transplant physician from China who passed by looked through the materials on display. He said he knew that the source of organs in China was questionable. “We used to do many organ transplants in my province. Now it has become a sensitive topic. Doctors do not talk much about it and the number of such surgeries has decreased a lot these past years.” He agreed that live organ harvesting still continues in China, except that it has gone underground. The physician came again the next day and took a copy of Bloody Harvest: Organ Harvesting of Falun Gong Practitioners in China in Chinese. After hearing about the systematic persecution of citizens in China by the Chinese Communist Party (CCP), he decided to renounce his membership in the regime. Hundreds of Chinese physicians attended this four-day event, and many of them accepted materials from Falun Gong practitioners. They thanked practitioners for their efforts to raise awareness about this issue.